This recipe will make 20 breakfast burritos for about $9. That’s 45 cents per burrito! I usually spend about 45 minutes making them from start to clean up. It’s definitely a favorite in both the Kramp & Kieklak households. Matt & I shoot for a grocery budget of $1 per meal per person, so this recipe helps us stay on track for sure! It’s nice to be able to eat a hot breakfast and still eat for cheap. *I shred my cheese, chop my potatoes & onion, and crack/whisk my eggs prior to beginning. Set aside until needed. 1.) 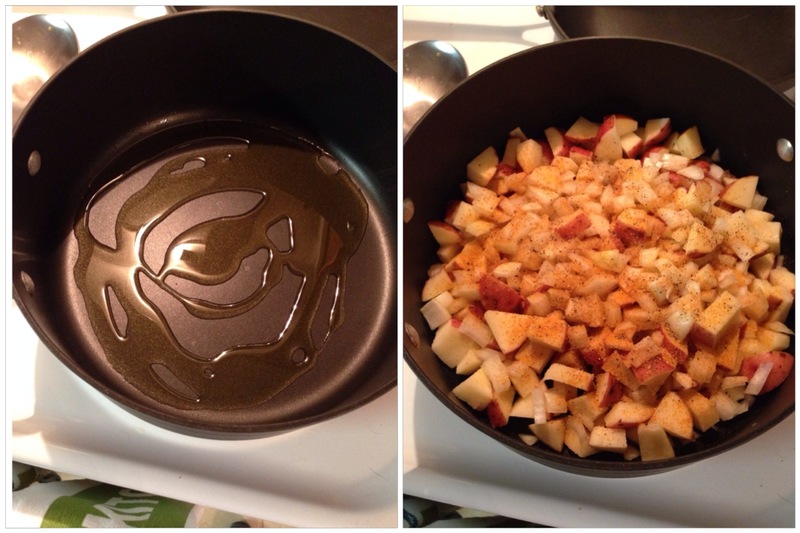 Begin cooking potatoes & onion in oil (about as much as pictured below) & desired seasoning. I used pepper and Lawry’s seasoning salt. Cook for about 5-10 minutes before beginning step 2 (in order for everything to finish simultaneously). 2.) Brown sausage completely & drain grease, then reduce heat to low and mix in cream cheese. If the cream cheese sounds gross to you, just leave it out (like Lisa does). Congratulations, your burritos are now 39 cents each. But I stand by my cream cheese choice, I think it’s what makes these burritos! 3.) Scramble eggs. I butter my skillet first and season my eggs with salt and pepper. A good trick Lisa taught me: On image 7 when you are folding, be sure and use the tortilla to tuck all the food inside. Otherwise, it might come apart when reheating. I labeled my burritos individually with an ‘s’ because I’ve also done bacon, ham, and veggie versions. Sausage is the best though! 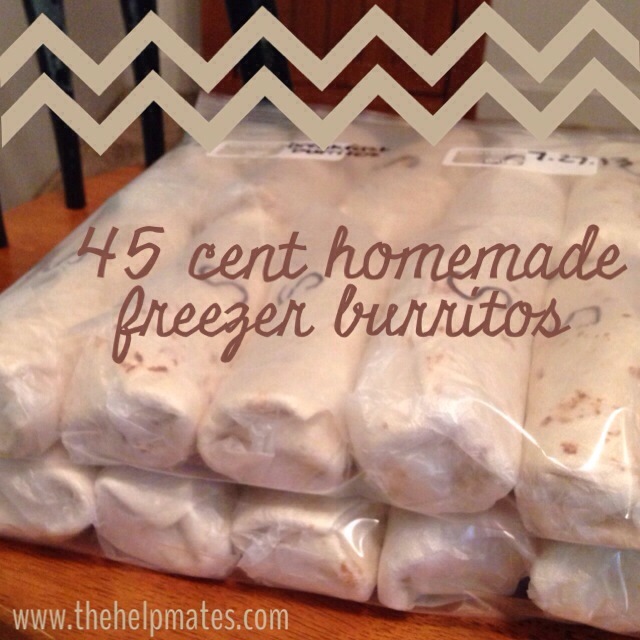 Once you have all 20 burritos completed, place them in gallon size freezer bags. They fit perfectly in two. Now they are ready for the freezer! When it comes time to eat them, you’ll want to defrost them in the fridge first. I usually keep 3-4 in our fridge ready to go. Then you microwave them for 1 minute, either with or without the plastic, both ways work fine. I eat mine with salsa, yummm! They will keep for at least 3 days in the fridge. And to be completely honest, I have no idea how long they’ll keep in the freezer. Matt & I both have hearty appetites so ours have yet to last over 2 weeks. They last at least 2 weeks, but I’m guessing they would be good for several months even. We get a wee bit excited over successful new recipes. Let me know what you think of them! *All ingredients were purchased at an Aldi in Southern Indiana where these items have no grocery tax. Prices may vary per store and per location. I shred my cheese, chop my potatoes & onion, and crack/whisk my eggs prior to beginning. Set aside until needed. Begin cooking potatoes & onion in oil (about as much as pictured below) & desired seasoning. I used pepper and Lawry’s seasoning salt. Cook for about 5-10 minutes before beginning step 2 (in order for everything to finish simultaneously). Brown sausage completely & drain grease, then reduce heat to low and mix in cream cheese. Scramble eggs. I butter my skillet first and season my eggs with salt and pepper. Once everything is fully cooked, transfer to a table where you have plenty of room to prepare the burritos. 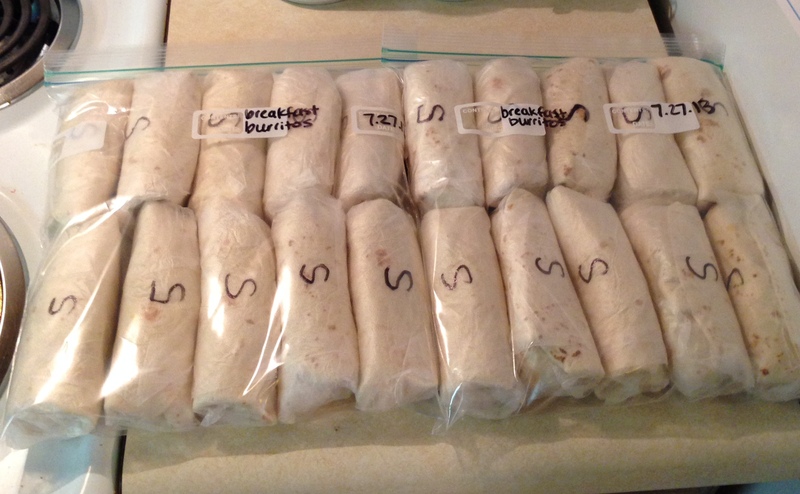 Wrap burritos in plastic wrap and freeze. Microwave 1 minute to defrost. Lover of all things sweet…my husband, our twins +1, our adorable cocker spaniel, and Reese’s peanut butter cups. But I know none sweeter than the name of Jesus. We made these tonight and left two out of the plastic wrap to eat as dinner. We only had enough eggs and sausage for 10 burritos and felt they would have been very skimpy if we had tried to get 20. The 8 that were left after we ate two fit perfectly in the gallon freezer bag. We honestly didn’t notice the cream cheese. If I make these again I think next time I will use frozen hash browns to save time and double the eggs and sausage. Just a thought for anyone else reading who hasn’t made these yet. 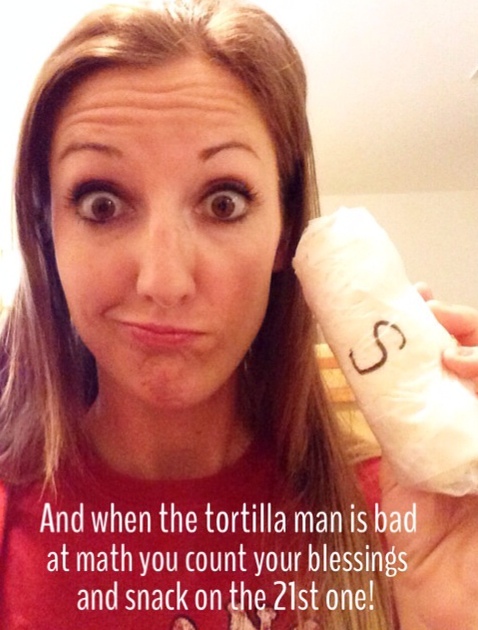 Are the Tortillas 8″ or 10″ ? My husband LOVES these. They are such a lifesaver trying to make breakfast ahead of time for the week and even some of the next week. Thanks! Yum! I made some changes based on what I had on hand (sorry!). I used 1 pound of frozen hash brown potatoes (browned), substituted ham for sausage, and used velveeta instead of cream cheese. I also used whole wheat tortillas. They were great! My burritos seemed kind of skimpy and I only had enough filling for 18, but they were filling. We’re trying the recipe this week with the original sausage and cream cheese. I might add a couple of extra eggs. Thanks for the great idea! Oh and I did everything in 1 skillet. Browned my potatoes and onions, mixed in the eggs and scrambled them (soft), added in the ham, velveeta, and cheddar, and stirred until combined and cheese melted. You might have to split up the steps if you use sausage like in the recipe, since it does give off grease. Looks delicious! Do you wrap them individually with Saran Wrap? It seems that step is missing from the directions…At first I was like ‘why is she writing on the tortilla w/ sharpie’? Awesome recipe I can’t wait to make for my husband as he needs quick hearty breakfasts. Have you ever tried putting salsa in before freezing? When you make them with ham and bacon do you still put in the cream cheese? What all do you put in your veggie? No, I’ve only done the cream cheese in the sausage ones. My veggie ones normally are a “whatever we have on hand” kind of thing. 😉 Peppers, Onions, potatoes, tomatoes, mushrooms (for the hubby – not me! ), etc. Hi Cara……can’t wait to try your burritos, especially the veggie ones. How do you prepare the tomatoes? Just slice? Remove seeds? Drain? And mushrooms….fresh or canned? Do you have a recipe? We made these with smaller tortilla shells and it made almost 30! And they are perfect sizes for my toddlers and me. 🙂 delicious! Haha, I’m so glad to hear I’m not the only one who is saran-wrap challenged! I use press n’ seal because it’s more grippy. But ziploc bags are a great idea too!! Good thinking, Laura! I love this idea! We accommodate some food allergies in our house, so I don’t think my version will be as cheap. But I’m excited about a low-cost, homemade breakfast that I don’t have to prep that day! I do have a question: Do you wrap them up and stick them straight into the freezer bag? Or is there an individual plastic wrap for each then the bag? I will have to try this looks good! do you have a website? This is our blog here, that’s the only website I have 🙂 http://www.thehelpmates.com and you’ve found one of our most popular posts already, hehe! I hope you like the burritos and the blog too!! Very yummy! I took a little shortcut and bought a bag of frozen hash brown potatoes to save time. I have to say, I feel bad for poor Lisa, she is certainly missing out, the cream cheese MAKES IT! OMG I never would have thought to do that, that’s brilliant! So glad I found this recipe! How long does it normally take you from start to finish? I’m about to wrap them all up and it’s taken me nearly and hour and a half. Does that sound right? Thanks!! Could you sub the cream cheese for sour cream? Yay!! I’m glad you found them too, Lynn! 🙂 Did you find us on pinterest? These are fantastic! I just tried them and now plan to stock my freezer with them. Yum! I just finished making these! They look delicious. I had issues with my tortillas breaking when folding. Do I need to heat them up first next time or buy better quality tortillas (I got mine at Aldi)? Thanks for the great recipe! Hmm…I got mine at Aldi too and didn’t have any issues. I bet heating them first would help. It seems like it would soften them and make them less likely to tear. Cara, I just found your blog and this recipe, and I’m so glad! I’ll have to try these soon. They might be a nice addition for suppers, too, on days when we’re both away from home until 6 PM 🙂 Thank you! Yay! I’m glad you found us! 🙂 let me know what you think of the burritos! We eat breakfast burritos a lot – usually not made ahead, though, and usually without potatoes and cream cheese. I’ll have to try that! Also, my husband and I add lots of jalapenos. Yeah, I’ve found that it’s great to make them ahead because they’re easy for Steve to have on the go. I can imagine that could also be helpful with Terry and the boys!